Of course we’ll make mistakes as we forge our own unique recovery path. A mistake most of us will make – that leads to relapse – is that we start coasting. We fail to prioritise recovery, and we let slide the habits and routines that keep us safe. Life subsequently creeps in as a higher priority and we become complacent. Our downfall comes when life gets in the way, or our bodies betray us, or stress arises from unexpected sources. Before we know it we are flailing, and risking relapse. We could have avoided all this if we’d been vigilant. Recovery is sustainable, though. It comes through self-knowledge… working our recovery, learning what our triggers and our times of risk are. And through having contingencies that we can turn to when it’s raining, or our sponsor isn’t around, or we’ve run out of vegetables, or we’re experiencing a phase of insomnia, or we get ill or injured. To implement contingencies we first need to have noticed when things started to slip, or began to get tough. This is vigilance I am referring to: noticing when and how things are changing. But, we’ll have to discovery for ourselves what works, because we don’t all take the same route through recovery. Self-knowledge comes from actively being in recovery and noticing triggers and risks: those times and situations when discomfort arises. It comes from learning what your body needs in order to be healthy: how much sleep and exercise, and what foods or supplements work best for you. It comes from knowing your mind: what helps you to relax, and to be in a positive mindset. That’s why relapse and failure and white-knuckling and sober-drunks happen. Because ultimately it is for you to learn what your recovery needs are, and how to ensure that they are met. It isn’t easy to remain vigilant. I’ll give you an example from my own life, when I almost derailed from my depression recovery. As part of my depression management I eat well, I take supplements, I exercise, I get good sleep, I am loved, I manage my stress. However, my mood recently began to crumble, and I was at risk. Why? Because Winter had set in, so I was missing runs due to the rain, and I was indoors a lot more. As a result SAD had crept in resulting in: longer sleep hours, less energy, carbohydrate cravings, and a decline in my mood. It was a slow descent, which I hadn’t noticed because I thought I was just doing things to avoid being cold. But once I worked out was going on I took action. I started vitamin D3 supplements, I resumed exercising outside [ref], I took daily midday walks [ref], and I used a light box. Within a week I was feeling better. In this example I was a bit slow in my vigilance, but I learned yet something else about my depression recovery needs. Recovery will never be easy, but it does get easier. The ‘easierness’ comes through knowing our recovery needs, and having contingencies to fall back on. When we are stable in our recovery we maintain it through light management, but we are never just coasting. We remain vigilant for when things change, and we diagnose why they changed. 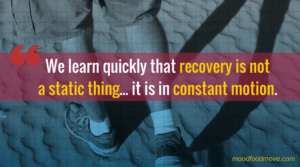 Our recovery becomes more stable, more solid, and more yielding when we understand the hows and whys of our unique recovery. And that’s how it becomes easier. Personally, as I got to understand my own recovery needs I found it a relief to learn that my struggles and relapses don’t just happen. As with my example above, problems occur for a reason. A relapse is the end point in a sequence where something is out of alignment, or has been omitted. It culminates in a collapse. If we are vigilant, and we make small adjustments when we notice something out of sync, we can avoid it escalating into a relapse. This how our vigilance pays us dividends. 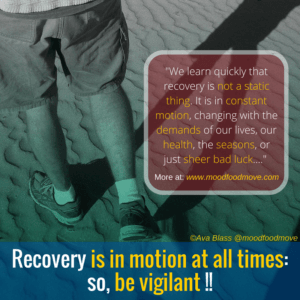 We have to keep maintaining ourselves in our recovery program, otherwise we don’t succeed. Maintain the vigilance, maintain the adjustments and contingencies, and keep learning about your recovery needs. 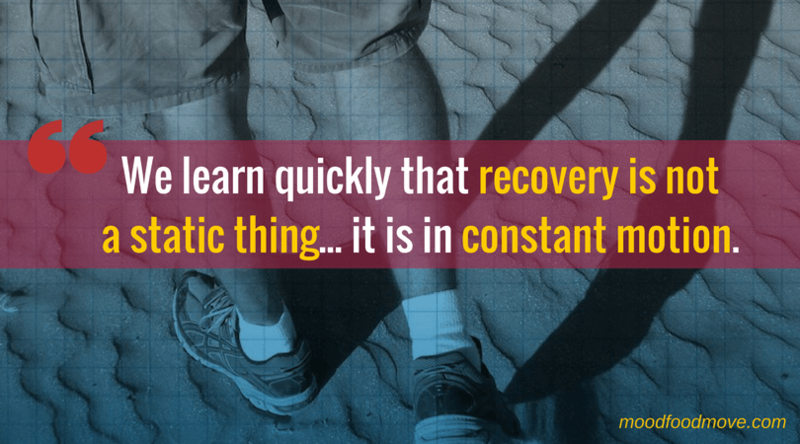 Recovery is primarily a growth opportunity. You are either moving towards recovery, or greater recovery, or growth. Or you are regressing and moving towards relapse, or your life is devolving. I have to push myself to continually expand and grow.